March 21, 2013 | DELPHI, IN | Residents at St. Elizabeth Healthcare Center in Delphi can now visit their doctors without leaving their rooms. The center — which offers rehabilitation and long-term care — now offers VGo, a sleek robot that allows doctors to video conference with their patients as well as record video and take high-resolution photos. Trilogy also owns White Oak Health Campus in Monticello and Homewood Health Campus in Lebanon, which both recently started using VGo. Schmiedeler said Cumberland Pointe Health Campus in West Lafayette and Creasy Springs Health Campus and St. Mary Healthcare in Lafayette could soon have VGo, too. If a resident has been seeing the same physician for 35 years, but now moved to St. Elizabeth, they can still see the same physician through VGo, said Nancy Distell, who works in guest relations. VGo is especially useful in areas such as Delphi which are further from specialists and where a doctor’s appointment can take hours between driving, waiting and the visit, Schmiedeler said. Plus, he said, doctors are able to squeeze in a quick 3- to 5-minute appointments to answer questions or on the weekend using VGo. “It’s an easy win for the doctors,” Schmiedeler said. 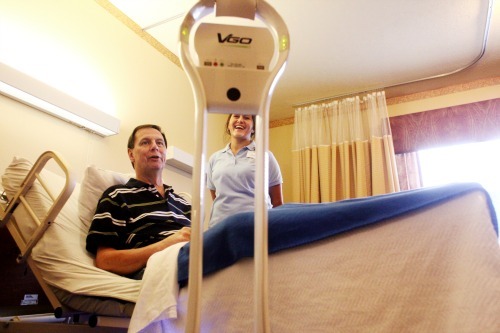 By installing an application onto their [PC or] laptop, doctors are able to use and move the VGo, he said. It’s powered by Wi-Fi [or Verizon 4G LTE] and offers a secure connection so no one else can access the conversations. And the resident doesn’t have to do anything to use it but talk to the person onscreen, Schmiedeler said. Though the use of the VGo at St. Elizabeth is just beginning, Tammy Shirels, who helps new residents adjust to the center, said residents are thrilled to have it. “The residents are embracing it,” she said. Not only can VGo be used for doctors’ visits, it allows great-grandma to see her great-granddaughter’s wedding across the country or for a pastor who is out of town to still visit his parishioners. She said she tells new residents about VGo and its uses. “It’s now part of what to expect,” Shirels said.